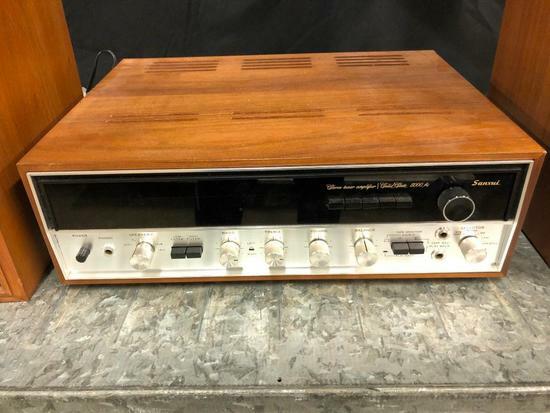 Innovative Auctions, Inc. » Stereo and Audio Equipment Auction! Stereo and Audio Equipment Auction! The unit had the two front main speakers hooked up and appeared to work just fine. It comes with a remote control. They were hooked to a stereo and appeared to work fine. Can't open cover to check cones. They sound fine. Pair of Sony Tower Speakers, SS-U541AV, The Covers are a bit rough. They were hooked to a stereo and appeared to work fine. They were tested on a stereo at building and appear to be and sound fine. I can't get the cover off to check cones. Again, they appear to sound fine. The unit had the two front main speakers hooked up and appeared to work just fine. This pair of speakers tested at our building on a stereo and appear to be fine. We can not seem to remove cover easily to check the condition of the cones. They seem to sound fine. The top of the interior portion of the cover seems to be dropping a bit on both speakers. It is not easy to spot. You have to look closely. These appear to be in almost new condition. They were tested good on one of the stereos at our building. They come with original boxes. Can?t remove covers on Zenith Speakers. The Boston Speaker Appets to be Fine. Pair of Tanoy Power POW V8 Speakers. No power cords to test. Seller said they were taken out of use working. Still as-is! I have no Speakers to Test on Unit. It does hit take typical Speaker Wire Hookup. It lights up when plugged in and appears to function properly. Still as-is. It is the sub woofer portion of a Speaker system. Have no cords to test. As-is. Marantz Cassette Deck SD 4050, it comes on and lights up. I have no cassettes to test it. Pair of JBL Bookshelf Speakers, Foam around Speaker is dry rotted. The foam is dry rotted around Speakers. Integra AV Controller DHC-80.3 (B), Apoears to still be new In Box!! Nice Unit! Soundcraftsman Model 20-12 Audio Frequency Equalizer, Does not power up? Not sure sure why? It does not power up! Sony SEN R5400 Amplifier and sub woofer that we can?t get to do anything. Plugged it in and nothing. Can?t find a power switch. May work if Speakers and stereo hooked up to it. Buying as-is!! Non working group of audio equipment. Some of the units light up when plugged. But, do not produce sound or function properly. Plugged in and hooked up speaker and it worked fine!! !